Thank you for shopping with The Quilters Studio. Please note that as soon as your order is submitted, the order is final and cannot be cancelled. All sales are final on cut fabric, books and notions. If you need additional assistance, please contact the store directly during business hours. Thank you for your order. Use the HQ arc set B to make either shallow or curved lines. Great for leaf shapes. Comes in 12" 8" and 4" templates. 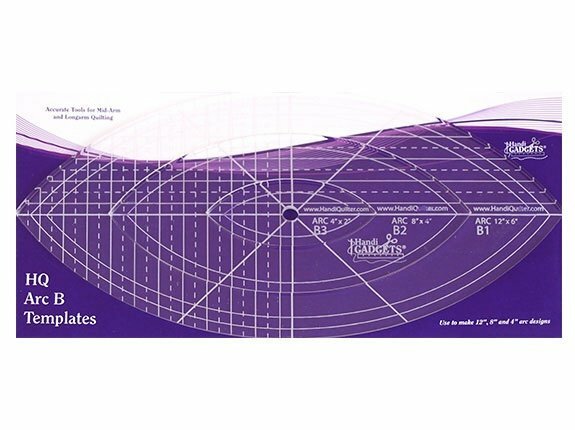 Ruler packaging includes instructions for use safety tips and design ideas. Use with the HQ Ruler Base for your machine.